My name is Suzi, and I have spirited kids. I guess that’s what we’re calling them these days. 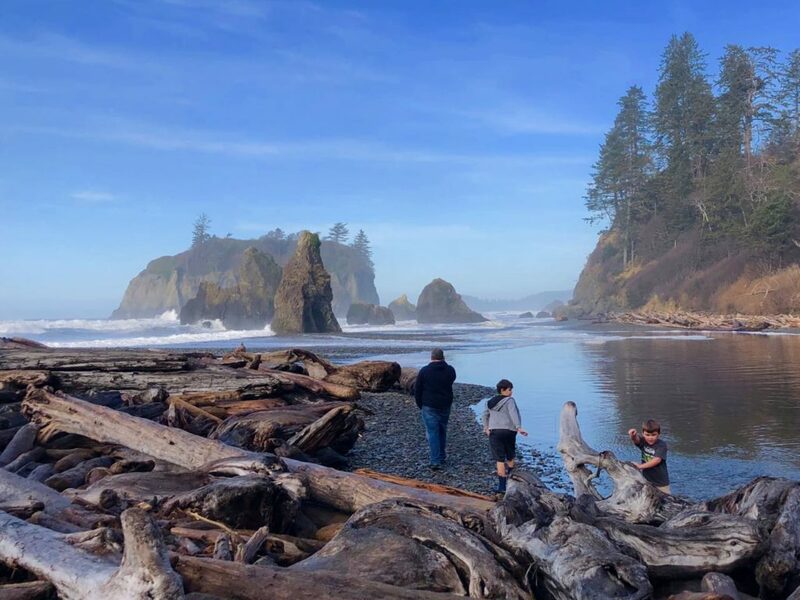 Over the past few years, I’ve learned to live with spirited kids, love spirited kids, discipline spirited kids, and now travel with spirited kids. If I can do it, you can, too — with a little bit of patience and a lot of inner zen. 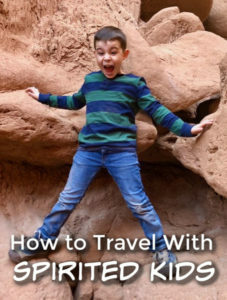 Also, if you are more interested in general advice, we’ve got that too in our guide to traveling with kids. Believe it or not, this isn’t even my most spirited kid. Spirited kids present a special sort of challenge when traveling. Actually they present their own special challenges in every aspect of life; it’s just that everything is magnified when you are are in a foreign place. Or trapped in a minivan going seventy miles an hour down an interstate. I was scared stiff before we left on our yearly “vacation” in the summer of 2017. 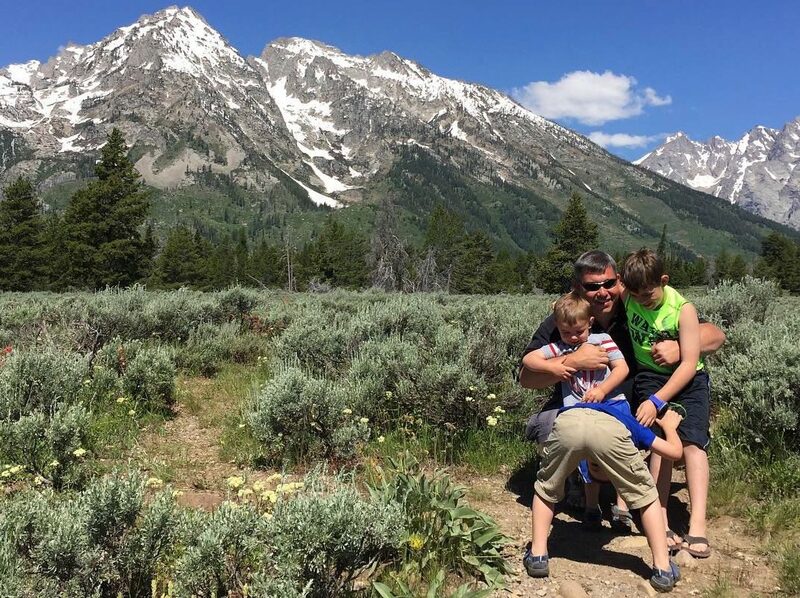 The five of us — MonsterDad, me, and the three little monsters — planned to drive from our home in Washington to my parent’s house in Utah, taking the long way through Yellowstone National Park. To say I was worried about the trip would be an understatement. At the time, I had a runner. As in, one of my kids was in this lovely phase where he would take off, fast and furious, with little regard for safety, whenever he got upset. Saying he wasn’t excited about the trip was an understatement (he wanted to spend the summer in our house reading books and watching television, and took every opportunity to tell us how much he hated road trips), and I started to feel less than enthusiastic as well. What if he had a meltdown in public because things didn’t go his way? Would he sit down at restaurants? What if he took off at a gas station in a strange town? What if he made his brothers’ lives a living hell in the back seat? The good news is that the trip went relatively well. We did a lot of preparation, we discussed the itinerary ad nauseam, and we tried really hard to limit last-minute changes. I used Ross Greene’s technique of Collaborative Problem Solving at every turn. I also spent every evening after dinner in a hotel room with him when he didn’t want to go anywhere, while MonsterDad took another child out fishing or hiking or otherwise exploring. 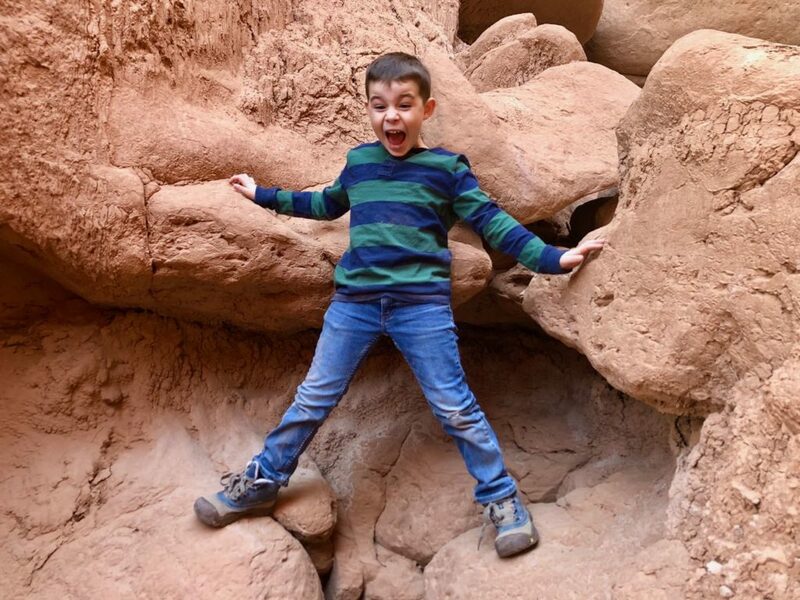 Over the years, I have learned how to travel with inflexible children and minimize meltdowns, because it is important to me that we continue to travel even when one of our kids is in a less than adventurous phase. However, there is a key ingredient to managing this type of family travel: emotional distance. AKA inner zen. Is this not the hardest thing to learn as a parent? I know intellectually that the beautiful little babies I birthed are no longer part of me. I am aware that these humans have their own hopes, dreams, and particular combination of DNA. And yet I feel their pain so intensely that it is immensely difficult to remain calm in the midst of a hurricane of tears, screams, and demands. Sometimes the best destinations just let those spirited kids run free in the wild. Over the past few years, we’ve learned how to build a family dynamic that allows MonsterDad and I to do the things we need and want to do — for us, that includes traveling the world — even when one of the tiny, spirited monsters isn’t excited about it. One of the critical parts of that process has been remaining calm and centered and not disappointed when one of my kids doesn’t behave the way I wish he would, or enjoy the things I truly want him to enjoy. My favorite babysitter (who is also a parenting expert and child behaviorist) taught me this mantra: “I am the Queen of my Castle.” It’s supposed to keep me calm while my kid is, for example, completely destroying his room in a tantrum. I have also used it when I plan an activity specifically for a child, hoping to see him happy, with stars in his eyes, only to have him declare that he “hates” that activity, or refuse to go for unclear reasons. Distancing my emotions from my kids has improved my parenting about a thousand percent. Managing to still have fun with our family even when one child is in a funk has been key for us. As a bonus, when we manage this, the “funky” kid usually comes around and has a good time too. And even if he doesn’t — even if he holes up with a book for three days in a row and I am still sad that he is missing out on amazing adventures — it’s okay. We find a way to make the trip work for all of us. Anybody else struggling balancing the emotions of parenting, especially while traveling with your family? Engage with us on Facebook, Instagram, and Twitter. I’d love to hear how everybody else manages to stay calm in the hurricane of family life!